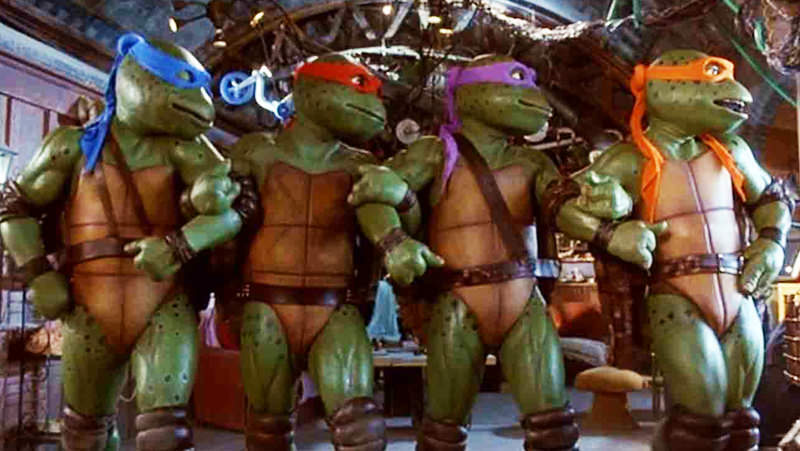 The Teenage Mutant Ninja Turtles franchise has gone through a massive resurgence in the last 10 years. Since Nickelodeon’s purchase of the rights in 2009, from retiring creator/owner Peter Laird, co-creator Kevin Eastman returned to relaunch the comic book series. A successful 5-season animated show has been and gone. A new reinvention, Rise of the TMNT, is on the way this autumn. Eastman also served as consultant for the Michael Bay-produced TMNT movies of 2014 and 2016 respectively. Not to mention new toy and merchandise ranges. And of course, the video games. It was almost 30 years ago that the NES classic, love it or hate it, hit stores. Since that time there have been well over 30 TMNT titles produced for almost all generations of home/handheld consoles. With the new series on the way, what better time than to recommend 4 of the best TMNT games of all time, each one representing a member of the team. Cowabunga dudes! The arcade original is video gaming at its classic best. Back in 1989 this style of arcade was everywhere in abundance: the scrolling beat em up. If it wasn’t Capcom, it was Konami. What was cool was the original cabinets allowed for 4 players on screen at once for the full team experience. Michaelangelo is the crazy, care-free member of the TMNT crew. Fun in short bursts, but ultimately a simple character who is true to himself and the team. What you see and hear is what you get. A stereotype of the time and style, whilst bringing a dose of fun and humour to any party. But he also always ready to fight. 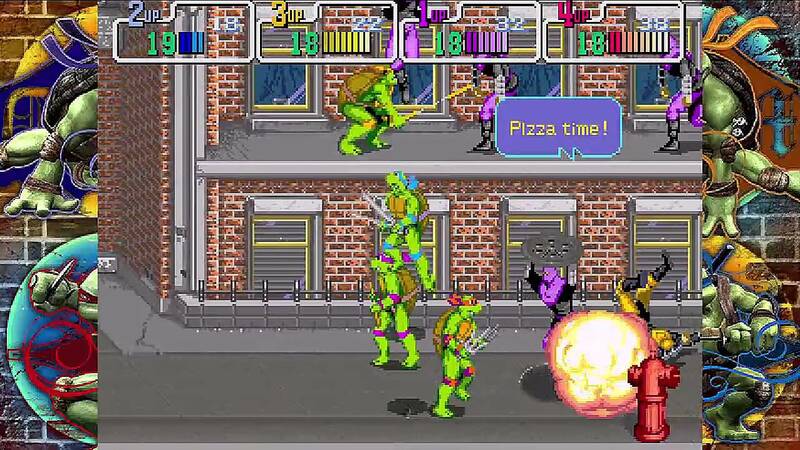 Just as well given TMNT the Arcade Game is 5 stages of excellent side-scrolling skirmish. 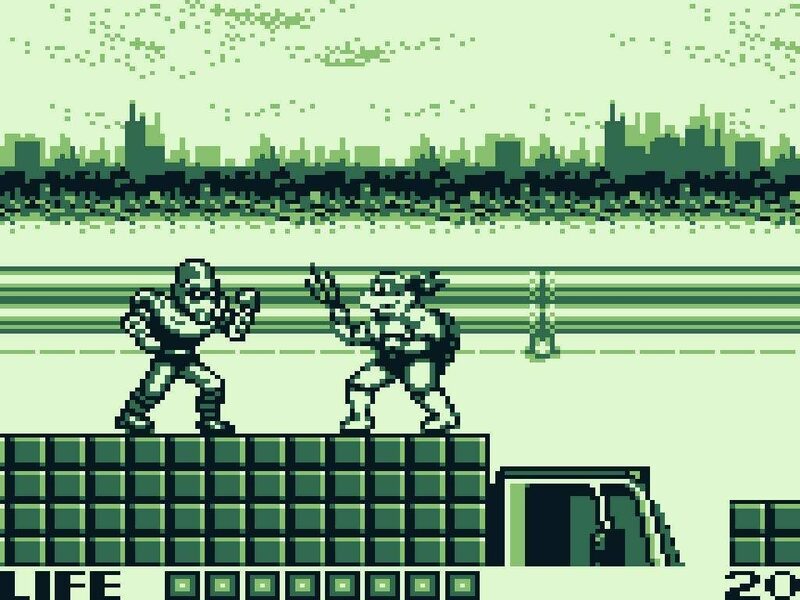 Fall of the Foot Clan was the TMNT’s first outing on Nintendo’s flagship handheld. An action/platform adventure, you take control of any of the teenage heroes through 5 stages. 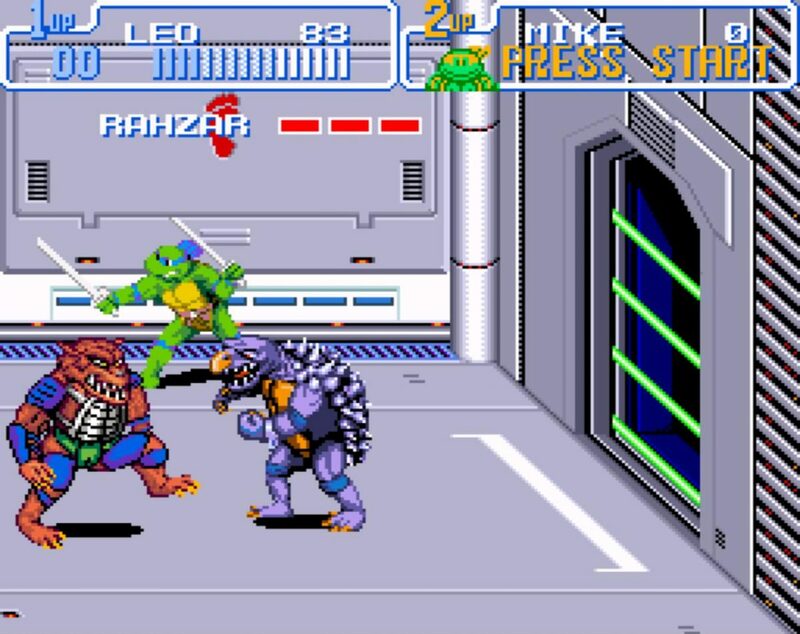 The controls are simplistic – standing upright with a press of the attack button takes a swipe with that Turtles’ respective weapon. Crouch and do the same launches a shuriken. Jump attacks are a simple-yet-effective kick. Traversing across sewers and above, the crew face Krang and Shredder’s army of foot soldiers and mousers, ultimately facing the evil odd-couple themselves. Should a turtle lose all their health, they are captured, which means choosing another. Enemies typically spawn frequently, requiring quick reflexes to survive, with little respite. Leonardo is of course the fearless leader of the TMNT. He keeps the gang in check and keeps them on point. He also serves as an excellent battle strategist. Much like the Turtles’ fearless leader, Fall of the Foot Clan adopts a serious tone throughout. It’s a tone much closer to the original comics than the 1987 series that launched its popularity worldwide. Furthermore, it’s an adventure that gets right to the point. You’ll need to be on your toes, with danger coming with every step taken. There is little room for error, which Leonardo rarely tolerates. And neither does Fall of the Foot Clan; a lovely slice of Turtles-action. 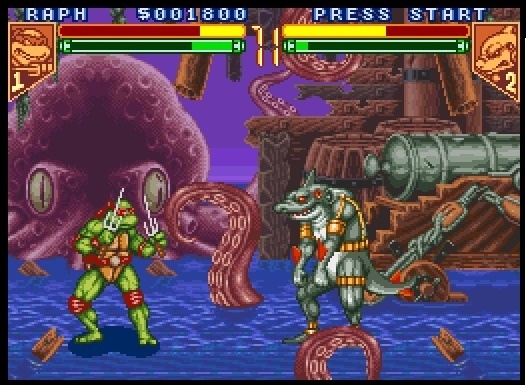 Turtles in Time for the SNES is the home conversion of the arcade game of the same name. Like the original arcade it was developed by Konami. This is surely the Turtles’ finest video game outing to date. Sticking very closely to the source material (the 1987 cartoon, with a little movie bonus thrown in), Turtles in Time is another scrolling beat em up. But it reached out further than any other adaption before it, thanks to the increasing capabilities of the home console market. 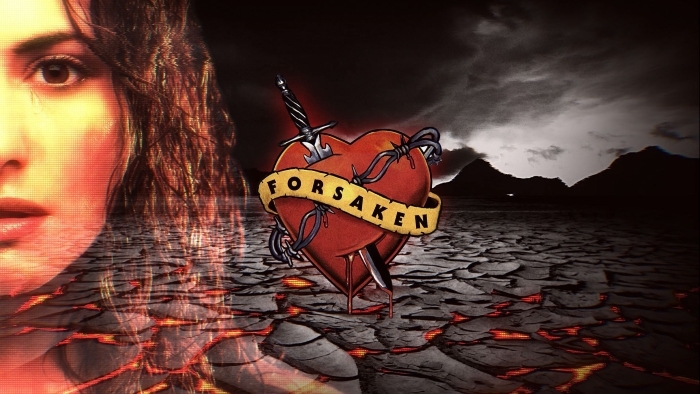 Additional elements that made the Streets of Rage series a success entered the fray. 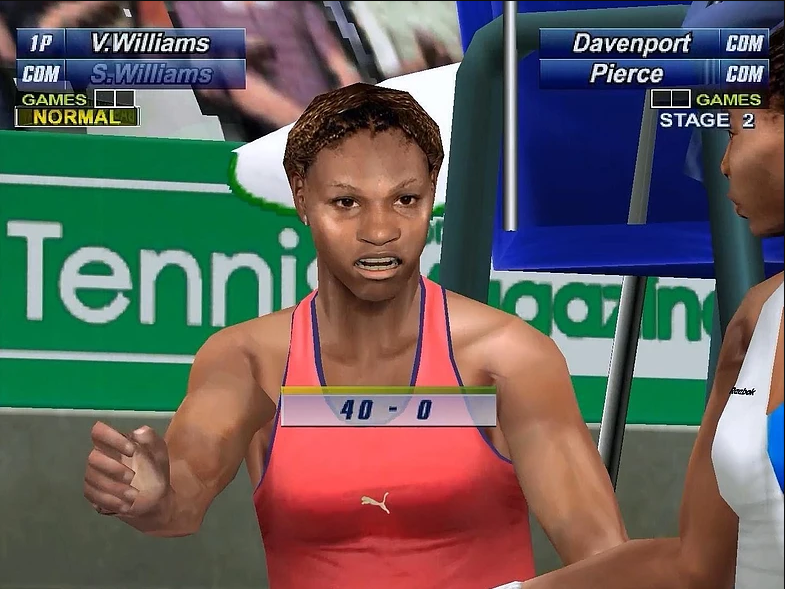 Grabbing opponents to slam or even throw them into the screen, low and high dashing attacks, plus the ability to run. Such inclusions sound simple, but back in 1992 these were considered reinventing the wheel. The levels look like something straight out of cartoon series. Each feature a boss from the cartoon continuity, such as Baxter Stockman as a fly, Leatherhead and many more. Mode 7 technology is used to significant effect, particularly the space board level. Yes, this game has space boards. These technological advances brought about the closest arcade gaming experience into the home. Turtles in Time takes such a conversion to even further reaches; adding extra levels, adapting some into multiplayer competition, including a 1-v-1 fight mode. Like many arcade-style beat em up’s, Turtles in Time is a short game. Even a recent run on hard difficulty clocked in at around 40 minutes. But it is oh so sweet. Even now there are few games of this genre that took such technological leaps. It’s surely a perfect match for Donatello. Turtles in Time has the technological advances and appeals to fans of detail from the series. As for the other sides of Donnie, to succeed you’ll need speed and strength. But at its heart it is simply super fun. 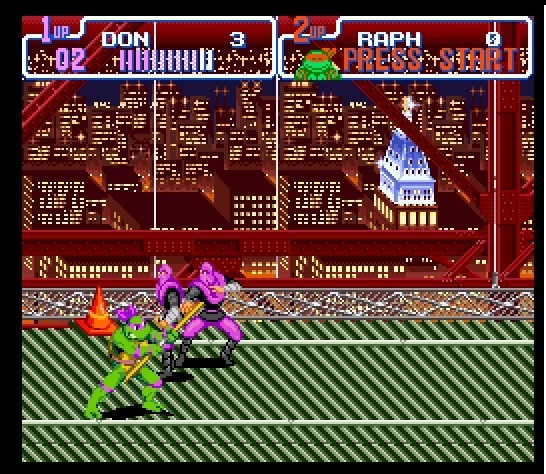 It’s a shame Konami no longer have the TMNT license. Turtles in Time is the definitive TMNT experience. In Turtles in Time, the gang may have gone “where no Turtle have gone before”, but with Tournament Fighters they really did. Konami developed this incredible effort to rival the Street Fighter II and Mortal Kombat fighting genre dominance. With 10 fighters at your disposal, including the four turtles, Shredder, and a backup roster that surprisingly resembles the Archie comic series more than the TV show. Throwing an array of cartoon characters into a beat ‘em up is no simple feat, in fact back in the 90’s it rarely worked. Until Capcom’s Marvel franchise took off, Tournament Fighters was the best comic/cartoon fighting game in existence. Tournament Fighters is a fast, fluid, and at times a very challenging fighter. Adopting the SNK 4-button style, Konami kept excellent balance, as well as creating unique fighters. and keeping. Like any SNK game, it’s simple to pick up but difficult to master. There is a wealth of moves to learn, satisfying super moves to pull off, and devastating combos to master. Raphael might be the only Turtle yet to be mentioned, but a title with as much attitude as this makes him the perfect match. It’s a brash, raw fighting experience that is satisfyingly tough to beat. It’s no coincidence that this title is much sought after in its original cartridge format; Tournament a great beat em up. Unfortunately, the declining quality of TMNT titles in the last 20 years is very apparent. 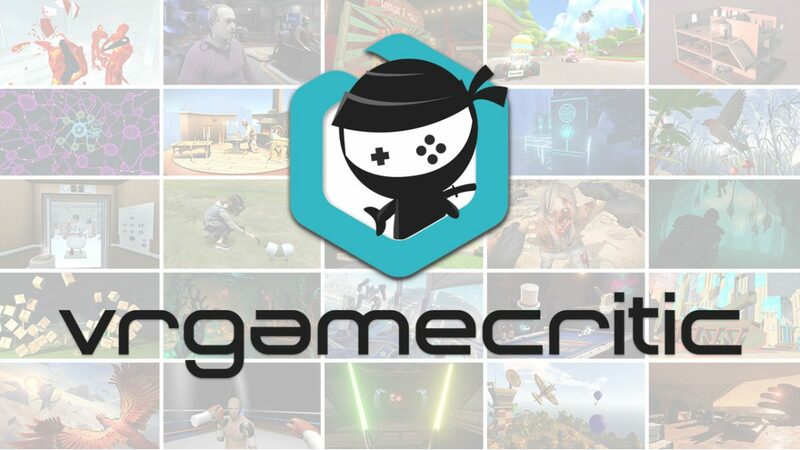 Only the recent PlatinumGames effort Mutants in Manhattan offered a memorable return to Turtle greatness. You can of course catch them as a recent roster update to Injustice 2. Please also enjoy the song below as a tribute to the amazing Turtles in Time. Pizza Power!